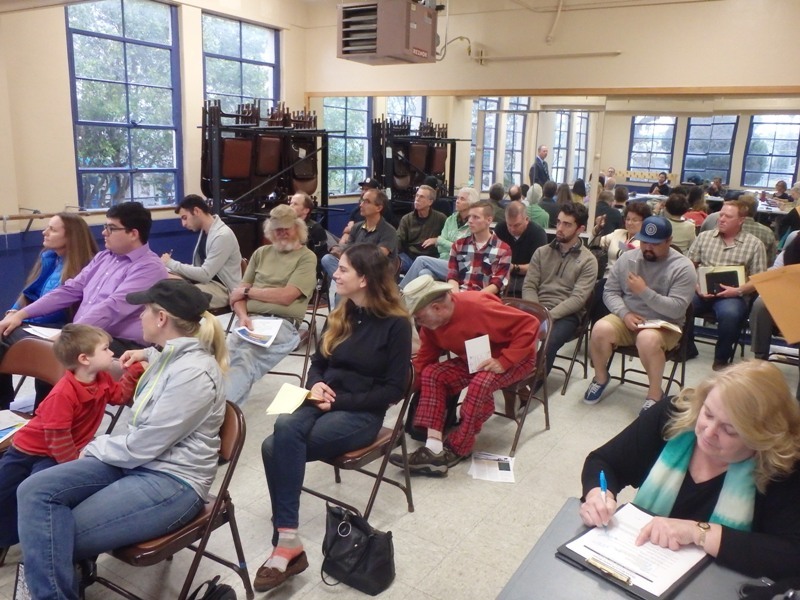 The audience at the OB Planning Board meeting, April 6, 2016. Members of the Board and Ed Harris can be seen in the reflection. A lot going on at last night’s OB Planning Board meeting. 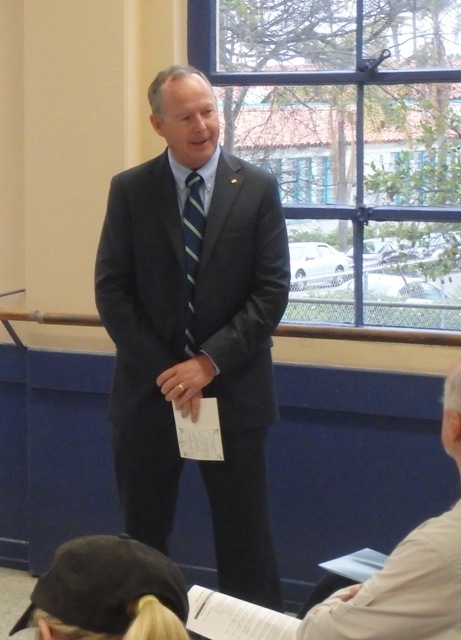 As nearly two dozen people crowded into the Community Meeting room at the OB Rec Center, they were witnesses to a type of mini-mayoral candidate debate, when candidates Ed Harris and Lori Saldana addressed the meeting. Also, the Board certified its March election and there was a change of chairs, as several planners left the group, a newly-elected member was seated, and the Board selected their officers for the next year. John Ambert will sit as chair for another term and Blake Herrschaft will continue as vice-chair. And then finally, the Board reviewed the proposed project for 4620 Del Mar Avenue and voted to recommend its approval. Harris criticized Faulconer for spending several millions on a Charger stadium study, while not spending that money on retaining police officers and other city staff. Still currently a city lifeguard, Harris cited the statute of a lifeguard near the OB lifeguard station. Faulconer helped fund the statute but real lifeguards have had trouble getting money out of him for their pay and benefits. Harris mentioned that a study found that San Diego’s coastal communities needed 7 new lifeguard stations a while back. Councilwoman Sherri Lightner got 3 for her district, whereas Faulconer – who used to represent OB and Point Loma within District 2 – got none for his district. But that wasn’t all. Harris cited Faulconer’s efforts to out-source city services. He said that those new lifeguard stations and towers were constructed by outside contractors, and that now they are having lots of problems. “They leak, the doors fall off,” he claimed. There is one lifeguard tower without flaws, Harris said, and that one was built by city workers. Harris also brought up the fact that while on the City Council, he opposed what he termed “the Belmont Park bail-out”, where he believes the city simply gave away city land to the developer for a miserable amount of dollars per foot ($1.62) whereas choice ocean property usually gets much, much more in leases. Mayoral candidate Lori Saldana also spoke before the crowd – although not in response to anything Harris had said. Saldana, a former State Assemblywoman, jumped into the mayoral race because San Diegans deserved a real race for the city’s top position. Saldana told the OB planners that she is against “top down planning” where rich people decide what gets built and approved, and she praised the local grassroots volunteer planners, saying “I appreciates the granular details that you have to deal with”. Saldana should be returning to OB, she commented, for a mayoral debate being put on by the OB Town Council, where Faulconer and Harris have agreed to attend. It will be later this month – and details will be forthcoming, hopefully. Election results for the March voting were announced by John Ambert, chair. Jane Gawronski won in District 5, and he – Ambert – won re-election in District 6. There was a tie in District 4 between incumbent Craig Klein and candidate Marissa Spata. The Board consulted with the City to figure out what to do, and upon the city’s advice, the Board approved Klein for the District 4 seat, and appointed Marissa Spata to an open seat in District 1. Several Board members left the Board. Dan Dannison, Pete Ruscitti and Valerie Paz are now off the Board. Dannison and Rucitti are expected to apply to be appointed to other open seats. Dennison has most of the required signatures and could be appointed as early as next meeting. Ruscitti told me that he expects to take a couple of months off from the Board before he reapplies. Paz is leaving the OB Plan Area. As a result of the election and seats not being filled, there are now a number of open seats on the Board that can be filled by appointments. When Jane Gawronski nominated John Ambert to be chair for a second term, it was a sign that the “old-guard” was approving the role of the “young turks” in leading the planning board. Ambert was selected, and Blake Herrschaft was selected – again – as vice-chair. Klein agreed to be Treasurer, but no one came forward to be Secretary. Standing in for the owner applicants – Jeff and Mary Northrup -, Will Mack and Jim made a pitch for the development proposed for 4620 Del Mar. The proposal is for an addition and remodel of a one-story house into a two-story with basement garage, plus the construction of a small companion unit. The overall FAR of the project is only .58 – certainly well within OB’s FAR of 0.70. The basement space is not counted into the overall FAR because it is below grade. There did not seem to be any outstanding issues, and the Board voted to recommend approval by a vote of 7-1-0. A City of San Diego representative gave a short presentation, telling the Board that the city plans to install an EV Charger station in the lifeguard tower parking lot. Whatever site is chosen, it needs to be near a transformer and near an ADA parking space. So, right now, the city is planning on putting in 2 EV chargers, one for the ADA space, by June. The OB Community Plan has to go before the Coastal Commission for some minor edits, Lorie Zapf’s aide, Andrea, told the Board. Not to worry, he said. Zapf is also looking to do a feasibility study over expanding the OB Library into space next door in a building already owned by the city. Ambert cautioned that the City needs to use the study already done years ago about the library expansion. Toni Atkins’ aide handed out appreciation awards to all the Board members. George Murphy made the announcement that he’s co-chair of the OB Library’s 100th anniversary gig, being planned for September 10th. Music, wine and cheese, he promised, plus a silent auction and space for groups to have tables for their displays. William Neal complained to the Board about a project near his house at 1721 Ocean Front Street that is being over-developed, that is, it appears to be built larger than allowed. Ruscitti allowed that the Board has received several complaints about the project, and that a check on the permit needs to be made. William Coleman brought to the Board’s attention that property managers are overly trimming the street trees in front of Pepe’s and the other small restaurants along Sunset Cliffs Boulevard. Vivian McCardle announced that SoCal Parrot is holding a Community Forum on the parrots on Monday, April 11th, right at the Rec Center, from 6 to 8pm. Let me start by saying that I like Ed Harris, I think he or Ms. Saldana would be excellent replacements for the current mayor. But, I have to question one part of this account. The article said that Harris said the lifeguard stations built by outside contractors leaked and were poorly done but the one built by city workers was flawless. City crews do not construct buildings, that work is all contracted out. Either Mr. Harris got some bad information or there is a mistake in this account. Constructing a building requires the use of many trades, electricians, plumbers, drywallers, underground utility placement, roofers, etc. The city crews do not have all of this expertise and the city does not have the management structure to to handle such projects. And, if there were the problems Mr. Harris recounted about buildings constructed by outside contractors, those problems would be the City’s fault for not managing the construction properly, but that would not be surprising. I think Mayor Faulconer is safe, if the big attacks center around he may want to run for Governor or he may want to keep the Chargers. And if you are against ‘top down planning’ , like Ms Saldana, you might want to control the size and scope of big government. ‘911 calls delayed for up to 15 minutes’ (even longer)…and these clowns want a new stadium? Bravo to all those OBecians who understand the importance of the OP Planning Board in maintaining a healthy, dynamic democratic community. Frank, isn’t this May the 40th anniversary of the vote that established the first OB Planning Board with the OBCPG having a community-saving majority? Editor Dude has been under the weather the last few days. He is laying low and hopes to be back on Monday. Uh, oh. Hope you’re feeling better, Frank. Hey, all the Best to Editor Dude Frank! Thanks – I’m back – not 100% – but back.